, a Swedish states. man and a man of learning, was descended of an ancient and respectable family, one of the members of which was created a count in the reign of Charles XII. 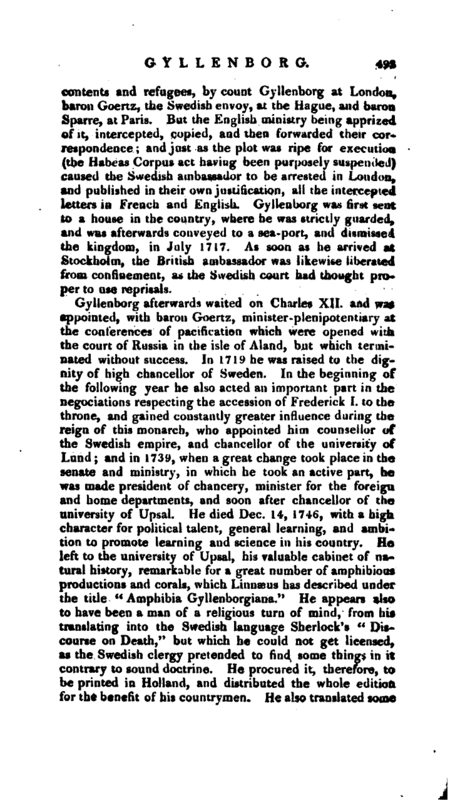 The display of count Gyllenborg 7 s political fame was first made at London, where he resided for several years in quality of ambassador from the court of Stockholm, and where his conduct brought upon him a very singular misfortune. In 1716, Charles XII. irritated against George I. for his purchasing of the king of Denmark the duchies of Bremen and Verdeii (conquered from the Swedish monarch) formed a project of invading Scotland from Gottenburg, with 16,000 men, and placing the Pretender on the throne of Great Britain. After the very recent defeat of a plan of this kind, this new one may appear somewhat romantic. 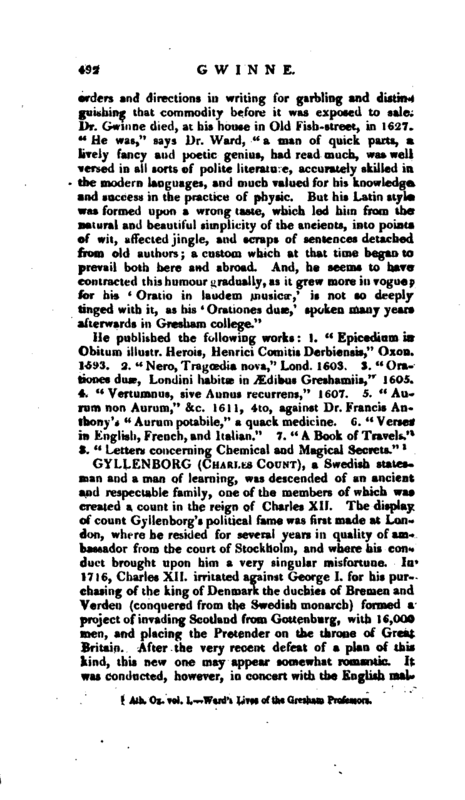 It was conducted, however, in concert with the English | malcontents and refugees, by count Gyllenborg at London baron Goertz, the Swedish envoy, at the Hague, and baron Sparre, at Paris. But the English ministry being apprized of it, intercepted, copied, and then forwarded their correspondence; and just as the plot was ripe for execution (the Habeas Corpus act having been purposely suspended) caused the Swedish ambassador to be arrested in London, and published in their own justification, all the intercepted letters in French and English. Gyllenborg was first sent to a house in the country, where he was strictly guarded, and was afterwards conveyed to a sea-port, and dismissed the kingdom, in July 1717. As soon as he arrived at Stockholm, the British ambassador was likewise liberated from confinement, as the Swedish court had thoyght proper to use reprisals. 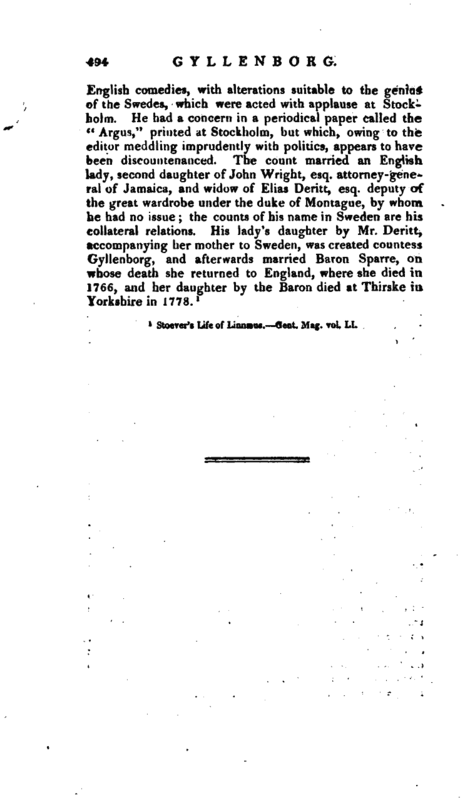 Stoever’s Life of Linnæus. —Gent. Mag. vol. LI.